There are certain foods that are quintessentially comforting. Soup, ice cream, cereal...sandwiches. They tend to multiply as we get older and our palates crave more flavors and textures but the foods we grow up with as kids tend to stick with us forever. Sandwiches came in many different forms while I was growing up. Peanut butter and jelly for snack time...cut in triangles, of course. Grilled cheese with tomato soup on brisk afternoons. Egg sandwiches for a great breakfast during high school and later college. Turkey sandwiches for school lunches with Hellman’s Mayo...not Miracle Whip. I could go on for days. Building a sandwich takes little effort but always manages to satisfy hunger. Today’s sandwich is a grown-up version of one of my childhood favorites, Turkey + Cheese. Using delightful, crisp apples from the farmers market, two types of cheese and bacon, this sandwich will leave even the hungriest with a full belly. Sometimes the best sandwiches are the ones that have interesting combinations of ingredients. While visiting the Bishop Arts District in Dallas, my cousin and I had lunch at this restaurant which served a grilled ham & brie sandwich with tomato chutney served on raisin bread. It was the most interesting sandwich I’d ever eaten and quite possibly one of the best. Ever since that day, I’ve loved playing with ingredients to come up with interesting sandwich combinations. Today’s recipe isn’t a particularly outrageous combination but I’ve gotten a few weird looks mentioning a sandwich that uses apples. It really is a wonderful combination of ingredients for both flavor and texture. For these sandwiches, I used a sourdough loaf from the farmers market and sliced it myself. You could use one type of cheese instead of two like I did but I love the neutral flavor from the Monterey Jack in contrast with the sharpness of Cheddar. One goes on each slice of bread to act as the glue for the rest of the sandwich. Bacon, apple slices, turkey and tomatoes pile high in the middle of the cheese for a delightful salty, sweet, tart and crunchy combination. Once the sandwich is cooked a few minutes on each side, the bread develops a toasty crust, the cheese gets gooey and it becomes a lethal combination that you might crave for future quick dinners. This sandwich would also work well with ham or even chicken in place of turkey. If you prefer to only use one type of cheese, choose between the cheddar or monterey jack or use a completely different kind like gruyere or havarti. Both would be excellent choices. 4 tbsp. Butter + 2 tbsp. 1 - Prep the melts. Spread ½ tbsp. Of butter onto one side of each slice of bread. Layer the sandwiches. 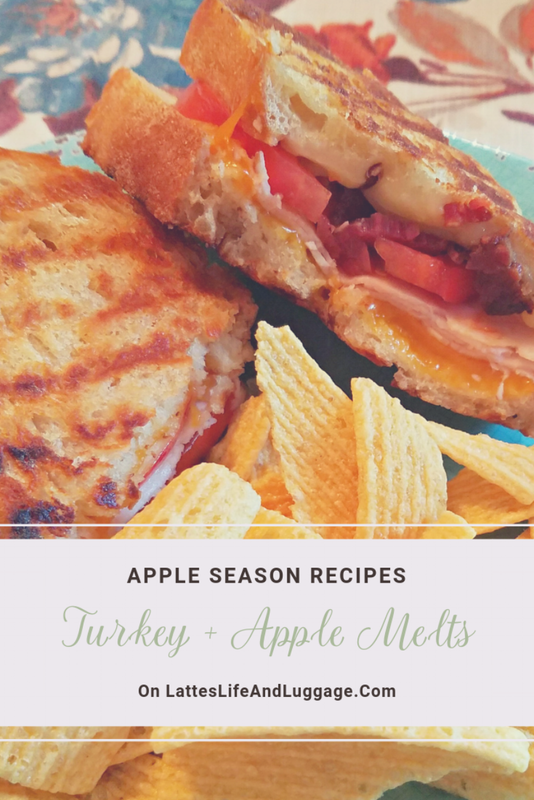 On the non-buttered side, lay a slice of the cheddar cheese followed by apple slices, the turkey, tomato, bacon, and slice of Monterey Jack. Place the second slices of bread with the butter side up. Build the remaining sandwiches. 2 - Warm a large skillet over medium-high heat. Add the final two tablespoons of butter to the pan and spread around. Add the sandwiches and cook 5-6 minutes per side until the bread is toasted golden brown and cheese has melted. Serve.